Doctors Warn That Soft Bedding Puts Babies At Risk : Shots - Health News Pediatricians have been telling parents for years that soft bedding, such as pillows and blankets, raises the risk of suffocation for babies. But many parents don't seem to be paying attention. For safety's sake, keep blankets, stuffed animals and pillows out of the crib. While blankets, pillows and quilts sound like the makings of a cozy bed for an adult, they can be downright dangerous in an infant's crib. The American Academy of Pediatrics says parents should keep the soft objects and loose bedding away from infants because they can inadvertently lead to suffocation. Furthermore, bedding has been associated with sudden infant death syndrome, the leading cause of death for infants 1 month to 1 year old. Yet a survey of nearly 19,000 parents with infants younger than 8 months found about half of families are still using soft bedding in their infants' cribs. 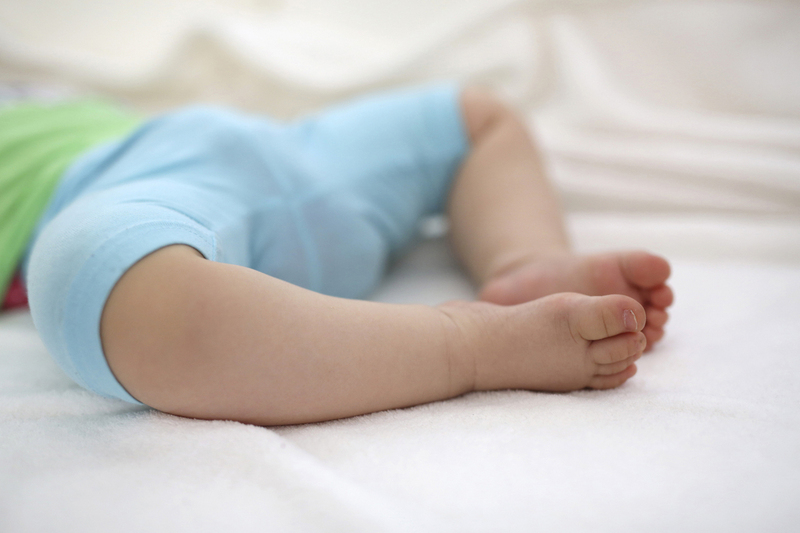 The analysis of data gathered between 1993 and 2010 in the National Infant Sleep Position Study survey was published Monday in the journal Pediatrics. The encouraging news is that there has been a decline in the use of soft bedding. The average number of infants exposed to the risky bedding dropped 31 percentage points — from 86 percent in 1993 to 55 percent in 2010. Declines were most dramatic in the 1990s, when the American Academy of Pediatrics and the National Institutes of Health issued recommendations that infants be put to sleep on their backs, without blankets or soft objects. The recommendations were driven by worries about SIDS and other sleep-related causes of death. "After all that happened in the 1990s, the rate of sudden infant death syndrome in the United States fell about 50 percent," says Carrie Shapiro-Mendoza, senior scientist at the Centers for Disease Control and Prevention and lead author of the analysis. Shapiro-Mendoza and her colleagues also found that between 1993 and 2010, teenage moms and mothers with less than a high school education were the most likely to use soft bedding for their babies, at 84 percent and 82 percent, respectively. 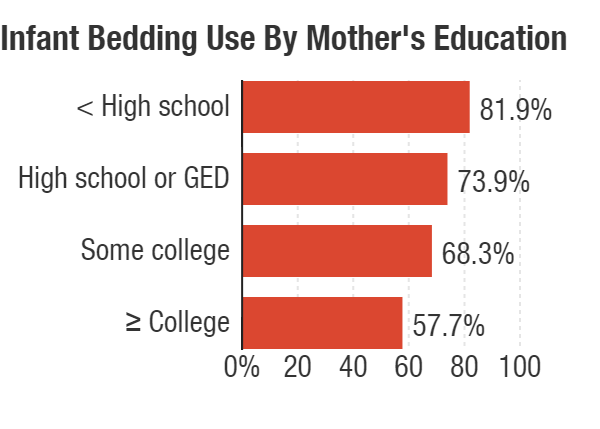 African-American and Hispanic mothers had higher rates of bedding use than white mothers. 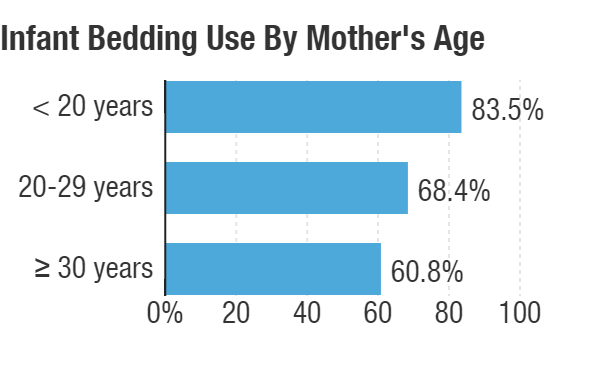 The lowest prevalence was found in college-educated moms at 58 percent. Infants with black or Hispanic mothers were also more likely to use soft bedding than infants with white mothers. "Why hasn't the message reached all parents? And why aren't parents hearing it or adhering to it?," asks Dr. Jeffrey Colvin, a pediatrician at Children's Mercy Hospital in Kansas City, Mo. Doctors probably did a good job of telling new parents way back when, he says, "but since then maybe we've become complacent." Pediatrics researchers suggest it could also partially be due to advertising, like magazines and TV commercials, that show mothers sleeping with their babies along with an assortment of blankets, pillows and fuzzy stuffed bears. "There's an assumption by everybody that if it's being sold in a children's store, that it must be safe," says Colvin. But a beautiful quilt isn't the best choice for your newborn just because it was sold at Babies R Us, he says. Instead, you can use a wearable blanket or sleep sack that wraps around the body to keep your infant warm at night. "The safest place for a baby to sleep is on his or her back in a crib or bassinet and in the parent or caregiver's room," says Shapiro-Mendoza. "The sleep surface should be firm, covered by a fitted sheet with no other bedding."